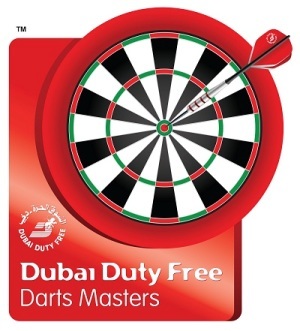 REIGNING Dubai Duty Free Darts Masters champion Michael van Gerwen began his bid to win the tournament for a third successive year with a hard-fought win over Raymond van Barneveld on Thursday as Gary Anderson, Phil Taylor and Adrian Lewis recorded superb victories. In an opening night of superb quality in the World Series of Darts event, three players - Anderson, Peter Wright and van Barneveld - all hit six perfect darts in their bid to win the Mercedes-Benz CLK-250 car which sponsors Sixt have offered for a nine-dart finish. Anderson also landed a maximum 170 checkout before sealing his win over James Wade with a 147 finish, while Stephen Bunting hit a superb 11 maximums only to be edged out 10-9 by Lewis. And defending champion van Gerwen had to dig deep to come from 4-1 down to defeat Dutch rival van Barneveld 10-8 in another outstanding contest, with the world number one ending the game - held in the unique outdoor arena at the Dubai Duty Free Tennis Stadium - with an average of 106.80. Van Barneveld was at his clinical best in the early stages as he opened up a three-leg lead and he also set up a possible nine-darter in the game's second leg only to miss out on a seventh perfect dart and then see van Gerwen take the leg. The world number one hit back strongly in the middle of the game as he levelled with legs of 11, 11 and 13 darts before responding to a 96 finish from van Barneveld with a 14-darter to square the game at five-all. Van Barneveld then took two of the next three to regain a slender cushion at 7-6, only for van Gerwen to find an extra gear once again, following another 11-darter with a 127 checkout to break and lead for the first time at 8-7. Van Barneveld landed an 11-darter of his own to break back and level, but van Gerwen took out a key 81 to break and move 9-8 up before hitting his eighth 180 of the contest as he sealed victory in the next leg. "It means a lot to me and I want to win this title again so much," said van Gerwen, who now plays Lewis in Friday's semi-finals. "The semi-finals will be cracking and I can't look too far ahead. I knew that I was playing well tonight and my confidence was there but when I had the chance to hurt him I didn't take it, and Raymond did it at the right times. I made mistakes and you can't afford to make mistakes in this tournament because it's really hard to win - it's difficult enough with the heat and the conditions, but I'm through to the next round." Lewis produced what he described as one of his best-ever performances as he defied 11 maximums from Bunting to edge a 10-9 victory, averaging 105.68 and hitting five 180s and a 174 in reply to his heavy-scoring opponent. The lead would change hands five times during a thrilling contest, with Lewis landing a 12-darter and a 101 finish early on and Bunting checking out 102 to level and a 12-dart leg of his own to lead 6-5. Lewis hit an 11-darter as he regained the lead, but Bunting would move 9-7 up with a run of three successive legs - only to be punished for missing three match darts as the world number four levelled and then hit a 180 and double eight in the game's deciding leg. "I thought it was a brilliant game," said Lewis. "It was tough but under the circumstances it's one of the best wins I've ever had. Stephen showed what a quality player he is and that he deserves to be here, and I tried my best to hang in there and match him. It's a massive step in the right direction for me and I'm very proud to get up there and play like that tonight." World Champion Gary Anderson was also in brilliant form as he claimed a 10-8 win over James Wade, who played his part in a high-quality contest and led 8-7 at one stage before the Scot surged to victory on his World Series of Darts debut. Anderson had finished 100 to take a 2-1 lead early on, and after Wade finished 128 as he edged ahead it was the new Premier League champion who then took out the maximum 170 checkout to level in leg six. Wade landed a pair of 12-dart finishes as the next eight legs all went with throw, and after he edged 8-7 up Anderson then took out another 100 finish, for an 11-dart leg, as he levelled. The Scot then claimed a crucial break of throw by landing his ninth 180 of the game and double five to move 9-8 up, before checking out 147 in the next leg to seal the win. "Everything's a new experience out here and I had no hopes going into the game, so it was good and I enjoyed it," said Anderson. James has been playing well for the last year and if you give him a shot he takes it out - but I've turned into that player myself and if you give me a sniff of it I'll have a shot. I played well on my own throw and but James had the advantage of throw and I knew that if I got a chance I had to take it, and I went 9-8 up and then took the 147 out. It would be nice to go on and win this now, especially with it being my first time here." Anderson now plays Taylor in a repeat of January's World Championship final as they clash in the semi-finals on Friday evening - after the 16-time World Champion picked up his first win in Dubai. Taylor had been defeated by Andy Hamilton and Peter Wright in the quarter-finals in the past two years, but gained revenge against the latter with a fine 10-5 victory. The pair shared the game's opening eight legs - including an 11-dart finish from Wright and his attempt at a nine-darter which saw him land two 180s - but Taylor pulled clear with five straight legs which included a ten-dart finish and a pair of maximums in another leg. Wright took out 100 to keep his hopes alive at 9-5, but Taylor fired in another 180 in the next before double 16 sealed his spot in day two. "It means everything to get the win because it's a tournament that I've never won and that I want to win," said Taylor. "I was pleased to finish Peter off there and I'm over the moon. I love Dubai but it's one of the places that I've not done so well in my darts so hopefully I can go through and win it now. Peter missed a couple of doubles in the middle of the game but once his back was against the wall he came out fighting and he's one of those players who can come back at you. I'm through and I'll take that - but I've got to have my head on against Gary. He's the favourite and it will be a good game, and both semi-finals will be crackers."